The 48m band is really suffering the effects of the summer conditions: high solar activity and thunderstorm crashes have affected signals for the last few days. 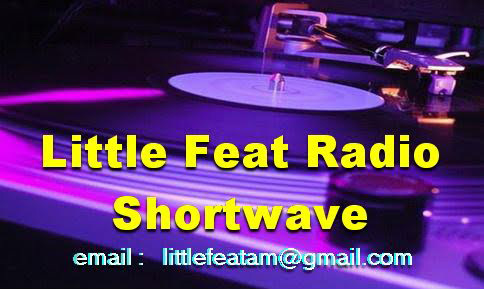 6262 @ 2003 Desperado - 35433; Low modulation, Slade - "Come On Feel The Noise"
I received this eQSL from Coast FM this morning along with other pictures of the studio and transmitters at Coast FM. Thanks Coast for the great info! Coast FM is a station which broadcasts in Tenerife. The SW transmitter seems to be currently on air from sometime on a Friday, then all weekend until Sunday evening on 6205 kHz. 6260 @ 2157 Nachtrijder - 35333; reporting to Ronnie in QSO. 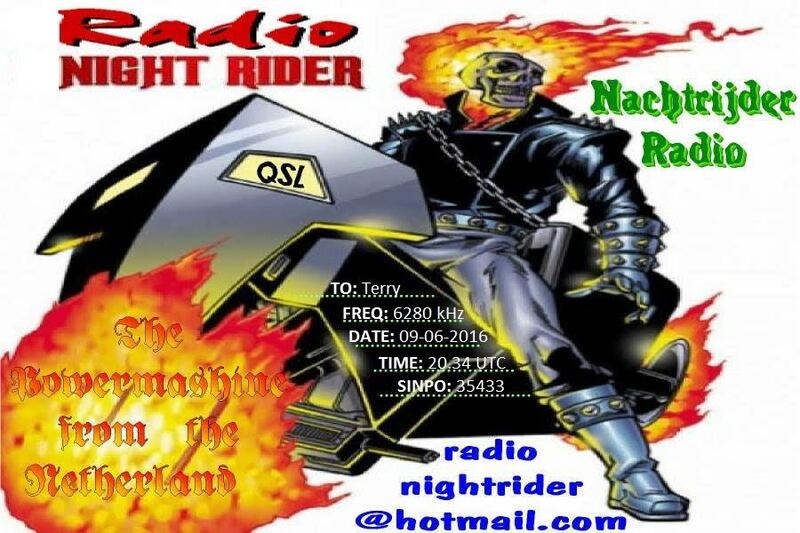 The Bellamy Brothers & "Let Your Love Flow"
Great eQSL received from Radio Nachtrijder for reception on the 9th June 2016. Thanks Nightrider! 5805 @ 2013 Laser - 35434; PM Dawn & "Gotta Be Movin' On Up"
6255 @ 1913 Merlin - 3-45434; Deep Purple & "Woman From Tokyo"
15770 @ 2114 R N. Ireland - 35433; SSTV, "Radio Free Europe" by R.E.M. 17.00 to 18.00 (Eastern Time) on 7490 KHz - Central & North America via WBCQ. Relays on 19th of June 2016:07.00 to 08.00 UTC on 11650 KHz - Southern Europe - Portugal & Spain via KBC. 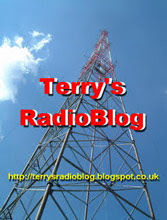 08.00 to 09.00 UTC on 9485 KHz - Western Europe & UK via MV Baltic Radio. 19.00 to 20.00 UTC on 6070 KHz - Western Europe & UK via Channel 292. 6305 @ 1557 Merlin - 45434; "Heart Full of Soul" by The Yardbirds. Then bizarrely @ 1607 down into the noise! Strange conditions today; Merlin was 45444 for a good while around 1555 and after a few minutes disappeared into the noise and did not return for over 2 hours. Similar signals were received from Goofy who was s9+20 for some minutes then disappeared for some time. This up and down propagation was mirrored on the 40 metre amateur band which I gleaned by listening to some UK operators. 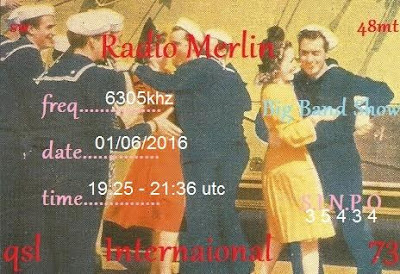 Radio Merlin QSL for reception on the 1st June 2016 between 1925 and 2136 UTC. Thanks Paul! 6260 @ 0902 Focus - 35433; "Wonderful" by Colin Blunstone, The Eagles & "Tequila Sunrise"
5890 @ 1611 Batavia - 34333; Benny Neyman & "Je hoeft me niet te zeggen hoe ik leven moet"
6400 @ 1935 Blauwe Panter - 35433; Dutch music, ID, "Trompeten Echo" by Leni & Ludwig, then switched to Deep Purple & "Child In Time"
6320 @ 2047 Python - 45444; Russian tracks, Python ID, Russian tracks known by Shazam, but in Russian alphabet! 6260 @ 2031 Focus - 45544; Chubby Checker & "The Twist"